This short bird walk around Regent's Park starts from Clarence Gate, at the top of Baker Street, and guides you through the park describing the types of birds you are likely to encounter. Enter the park at Clarence Gate, which is at the top of Baker Street (View map). One of the first birds you are likely to encounter is the Grey Heron. In recent years, this bird has taken to gathering here to be fed by certain park users. Feeding the herons creates a number of serious problems and is something we are trying to discourage. View advice on appropriate ways to feed birds in the park. This busy entrance to the park has become a very popular place to feed the waterfowl. Here you can get close to wild birds and some of the park's ornamental waterfowl. The species you are likely find here include: Tufted Duck, Pochard, Red Crested Pochard, Coot, Ruddy Duck, Canada and Greylag Goose, Whooper and Mute Swan. Now turn right and cross over the bridge, then turn left. Make your way along the edge of the lake, although the metalled path swings away from the water. Head past the Bandstand, and stand looking over the lake. Look out for Grey Wagtails that feed in this area. To your left and right are the lake's two largest islands, which together accommodate 22-26, breeding pairs of Herons. You may also see Common Sandpipers on the banks of the island in May, August and September. The best time to view birds flying over the park is in the first few hours after dawn. From here, with the sun behind you, there is a large area of open sky which is on the south-west to north-east migratory line. Birds you may see (depending on the season) include Swallows, Sand Martins, Swifts, House Martins, Sparrowhawks, Hobbies, Peregrine Falcon, Pipits, Wagtails and Finches. On the water to the right of you, you may see birds which are timid, these are likely to be genuine wild birds: Wigeon, Gadwall, Teal and Pintail. 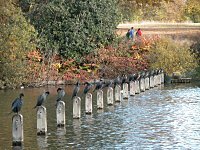 Cormorants can be seen on the posts that restrict the rowers to one part of the lake and allow the waterfowl the chance to breed and roost without disturbance. The island to your right also holds upwards of fifty roosting cormorants during the winter months; they can be seen flying in at dusk. The small geese that may have wandered over are Barnacle and Bar headed Geese and are part of the collection. Return to the path and proceed up the hill. This will take you to a road called the Inner Circle. On the opposite side of the road is the Rose Garden CafÃ© and the entrance to Queen Mary's Gardens. These beautiful gardens have some quiet areas that can harbour summer migrants such as Blackcap, Chiffchaff, Willow Warbler and Spotted Flycatcher. It also has a small lake with a collection of waterfowl. Find our more about the Birds of Regent's Park. You can also view recent bird sightings in Regent's Park from the Regent's Park Birds website.